I can not even begin to tell you how excited I am to finally be able to share this post with you. If you follow me on Instagram than you may have an idea of how long I have had a couple of Powder Perfect's stamping polishes (the black and the white) and you will also know how much I love these! Jacinta asked me if I wanted to try out the other three stamping polishes and of course I jumped at the chance! Probably literally jumped I was that excited. 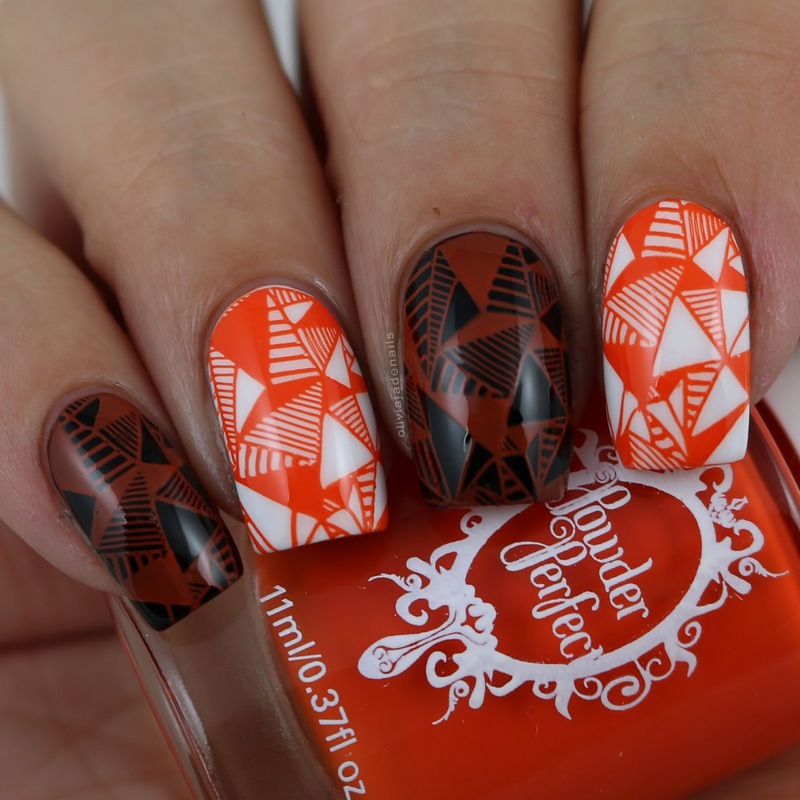 Today I have swatches and a review of ALL five new stamping polishes to share with you. For all of my swatches I have used a black and white base so you can see how each polish looks over both light and dark bases. The image I have chosen is from Bundle Monster BM-X212. I picked this one mainly because it has a good mix of solid pieces, thicker lines and thinner lines so it can really show you how each polish performs. I also used my Pueen clear stamper and scraper. 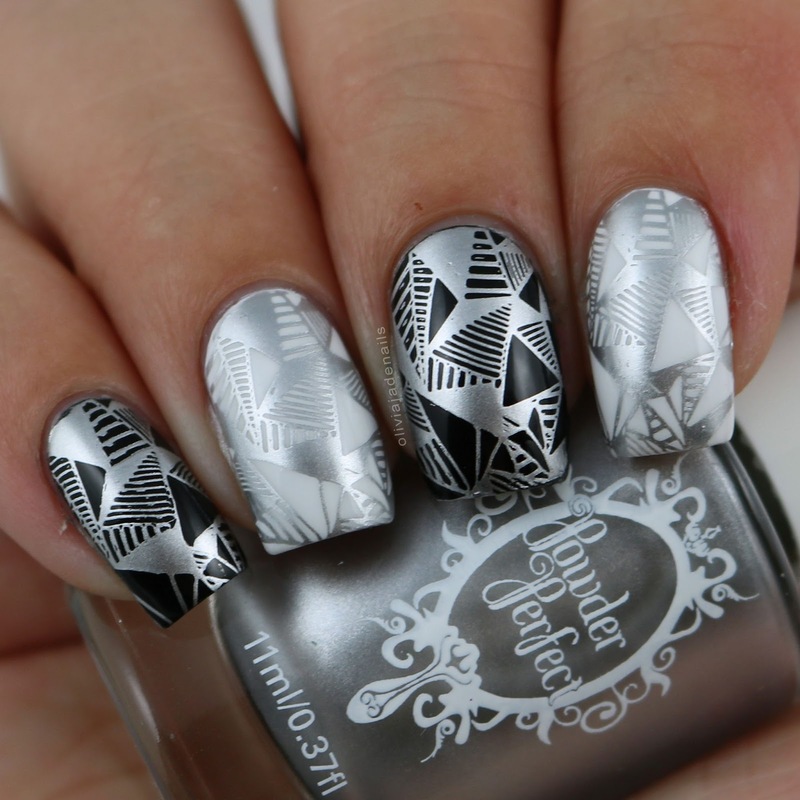 Each of the stamping polishes is slightly thicker than your regular polish but not super thick. I find that only applying the polish to the top of the image before scrapping is needed. You definitely don't need to apply the polish to the entire image. I also recommend leaving a couple of minutes before applying your top coat to prevent smudging. Right, now onto the colours! The black stamping polish is shown over white on my ring and index fingers. The white stamping polish is shown over black on my pinkie and middle fingers. What I love about these polishes: EVERYTHING! What I don't like: how quickly I have used them up (particularly the black - my bottle is already half empty). You can bet I will be stocking up on the black and white. The metallics are also really good. I like that they don't dry super quick so you don't have to work as quick as you do with other metallics. And while they are shiny they aren't over the top shiny that they reflect too much of the light and look bad in pictures. 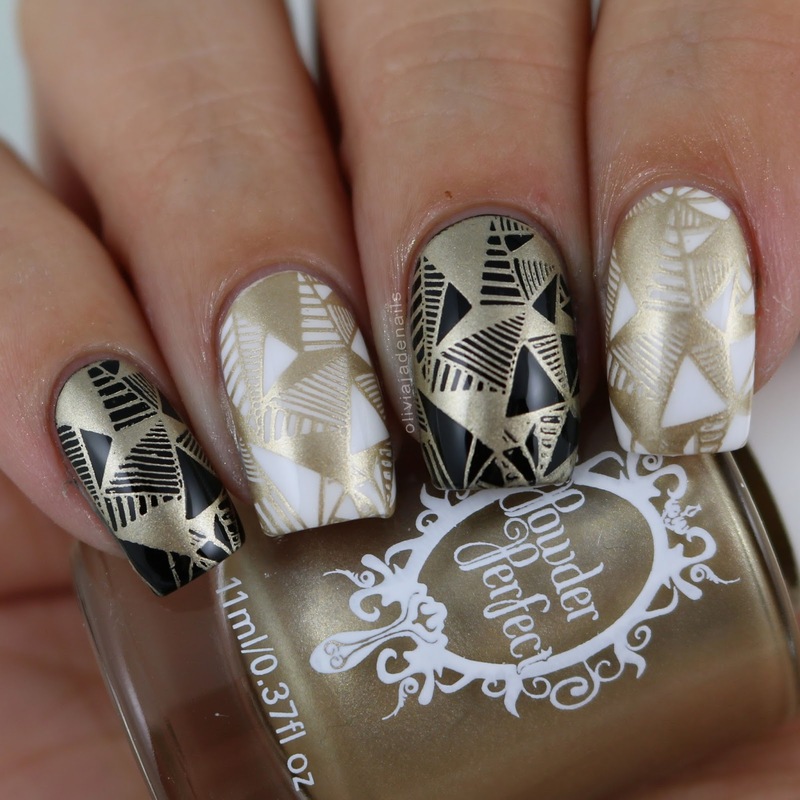 That is a big reason why you don't see me using metallic stamping polishes too often. I can never get them to photograph nicely. The stamping polishes are available from Powder Perfect's Australian Store on Friday 30th September at 10am AEST and from their international site on Thursday 29th September 8pm EDT. *EDIT: I have just received a discount code you guys to use. If you use the code NAILSTAMP you will receive 10% off all stamping polishes, stamping plates and accessories. The code is valid until January 31 2017.